It’s the ever-talented Kellie again – I think we need to get that girl her own blog! She’s kinda busy though, and she’s generous enough to let me share her artwork with you. This is the Fancy Favor Bigz die for the Sizzix Big Shot. 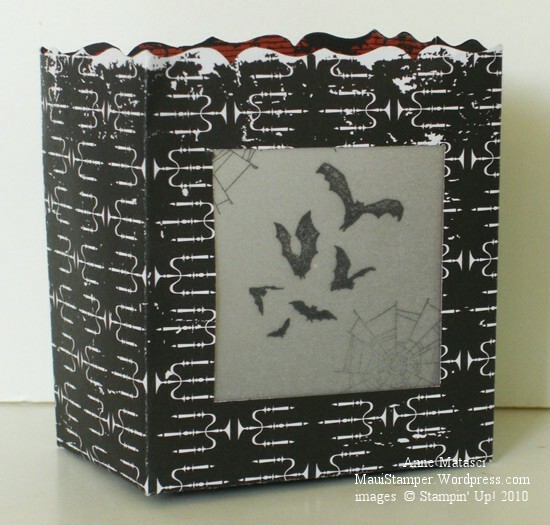 She put vellum windows on either side and stamped them with the bats and spider web from the Wicked Cool stamp set. One of those little battery operated tea lights would be just the thing inside this luminaria, don’t you think? 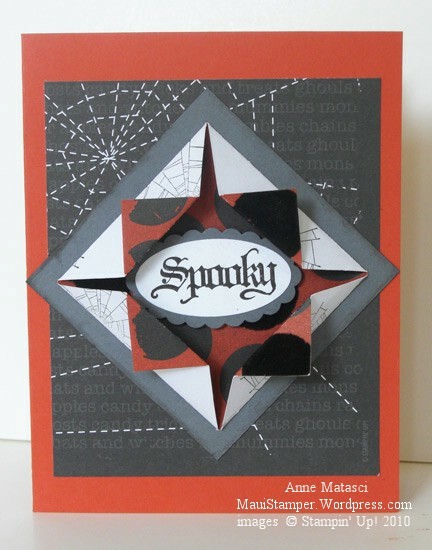 This is Cajun Crazy card stock with the Wicked Fun Specialty paper. Those folds are such an easy technique but boy do they make this card pop! Have lots of fun and stay safe this Halloween night! Kellie…I love the vellum idea! You’re very creative!